INFJ is a personality type which is characterized by the Myers Briggs Personality archetypes. It is extremely rare and comprises 1% of the entire population. The initials stand for the following: introverted, intuitive, feeling and judgment. If you have been the “odd one” from a young age, you probably belong to this rare personality type. You have always felt different from the people around you. You might have plenty of friends, but you never felt like you truly fit in. there were times you faked being more like them so they would accept you. Getting to know the real you in surely a Herculean task since you can be both incredibly shy, quiet, and withdrawn, as well as charming, fun, and hilarious. It depends on the mood and the situation, most of all the kind of people you are with. What is “the door slam”? 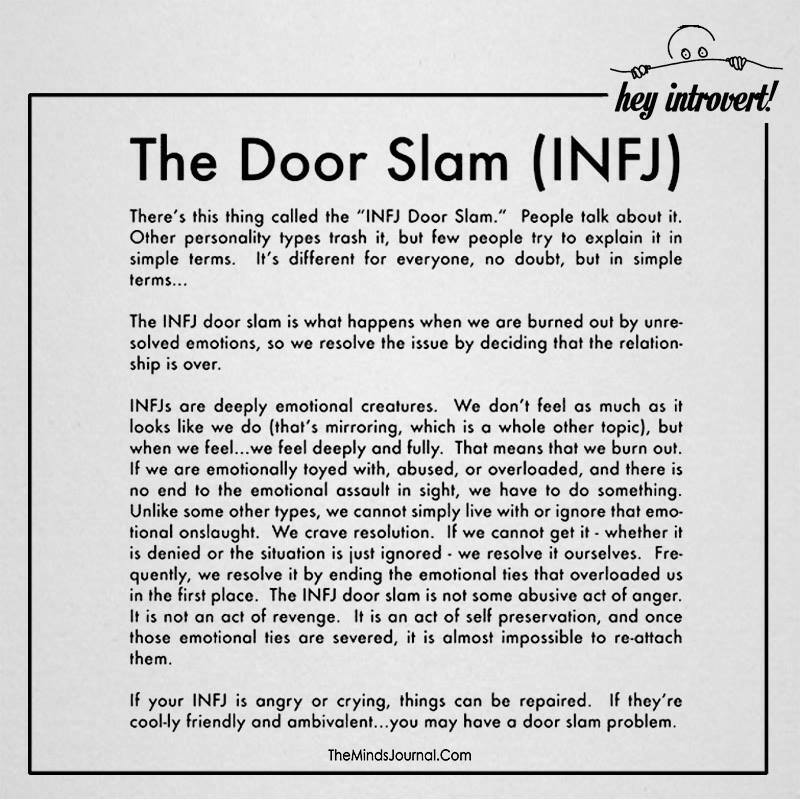 The door slam is when an INFJ suddenly cuts off all contact with someone. It might be a close friend, partner, coworker, or family member. INFJs are the typical “all or nothing” kind of people. So if they are treated terribly for a long time, they will tolerate for a while before severing all ties. They will block all numbers, social media links, not cross the same path and in extreme cases, move without a definite address. Removing someone from their life is a self-protective measure to stop the emotional pain. INFJs are good with people and are known for their characteristic feature of tolerance. 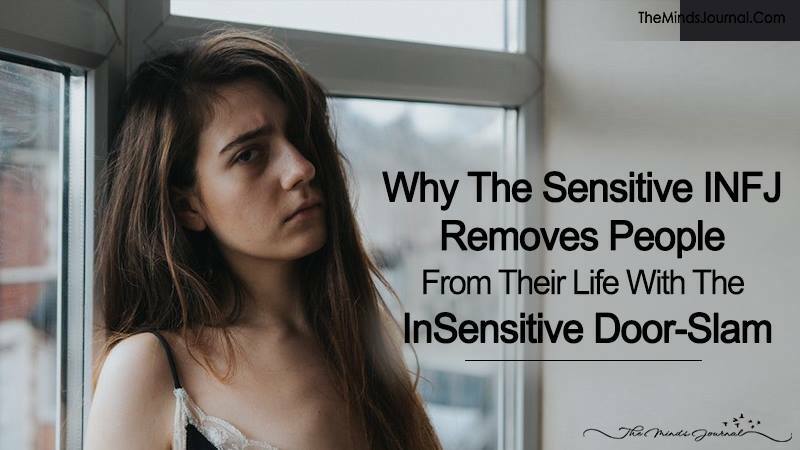 Some of them may also hope that the slamming of the door will result in a magical realization in the other person and they would value the former. INFJs do not revel in drama or ending on a bitter note. 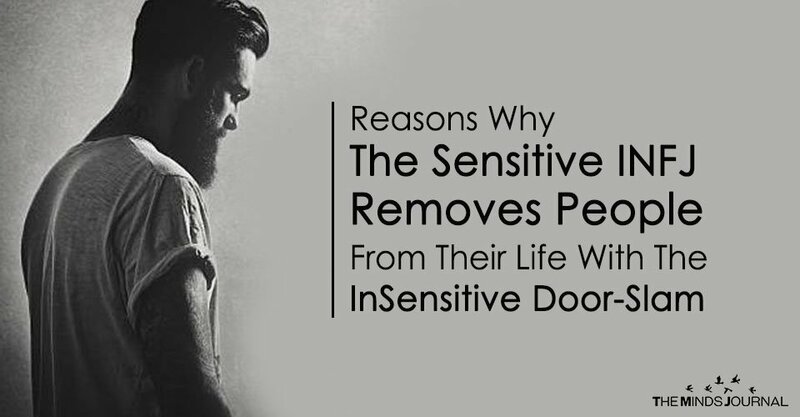 The door slam is the last straw, a final chance for the other person to understand and notice. INFJs can foresee the loss of connection with a person and it makes them mournful. Often we cherish the idea of a person, build castles in the air without seeing things as they are. Then in a moment of epiphany, it dawns upon us that what we had actually did not exist. 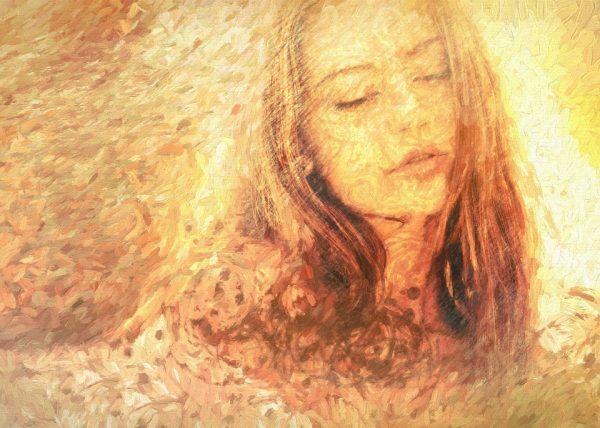 It is a common thing with introverts — it means that they internally process much of what goes on around them. They do not react or let loose. If you pay attention, you will be able to see the red flags which INFJs show before the door slam. They make it obvious that they are not happy with a kind of behavior or find a certain action unacceptable. The fallout is a result of a prolonged internal mourning because they realize the other person involved is not willing to change one bit. INFJs don’t give up easily but once they are done, they are done. INFJs are very emotional; they tend to prepare themselves mentally before taking the final step. This is the reason behind them moving on swiftly. They do not like to spell out things and expect that someone who deeply cares for them will make efforts to show the same. They want perfect understanding in a romantic relationship more than anything else. Yes, they seem to be complicated people, but if you get close, you’ll see their needs are actually quite simple.